So evidently, when someone is selling you grams of something and there is a discussion of payment and a scale, the household teenagers become suspect. 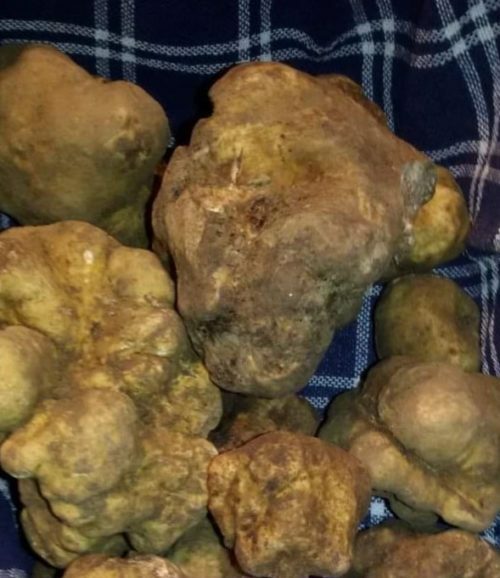 Little did he know that our ‘deal’ was for coveted black and white truffles, shipped from Italy to the U.S., and the high finances and need for a scale was to pay for this amazing delicacy by the ounce. Ever since I wrote an article on truffles a few years ago, Secondo and Prima have been enamored with truffles, truffle salt, truffle fries… and this experiment proved to be just as delicious. 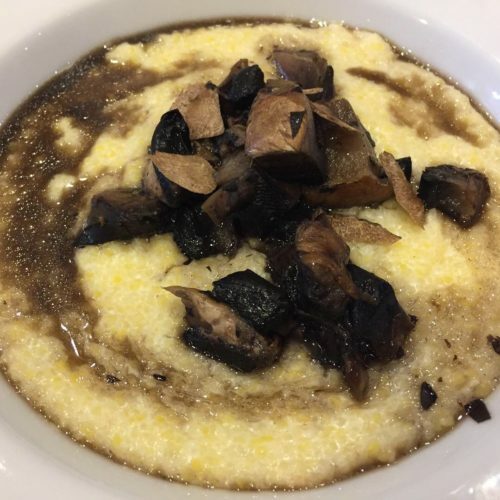 Thinking back to the days when I first visited Italy with my paternal grandmother, Ginny, and my paternal grandfather, Elios “Andy”, our trip to her hometown provided me with my first shocking experience with REAL polenta. Wipe the look of surprise from your face. I am NOT referring to the glamorous interpretations that we find today, that are silky in texture and laden with butter, cream and cheese. Instead, I’m speaking about the frill-less glob of gruel that hits your plate like a rock and is hardly able to detach itself from the wooden spoon despite several severe shakes of the arm. If that depiction doesn’t have you convinced, let me continue with the rest of what was served. Placed on top, as if it is the answer to the digestion problem about to ensue, is a medium-size disgustingly greasy, with hard fatty unchewable bits speckled about, sausage patty that is extremely disproportional given the size of the mound of dry waterless cornmeal on your plate. I would certainly be remiss if I didn’t mention that soda was offered, and somehow with that bit of liquid kindness, I managed to choke it all down. At the young age of 15, I was then further traumatized to realize that because I had eaten so quickly, due to my sheer distaste as I attempted to rid myself of this disastrous meal, I was “gifted” a second bowl of gruel with the accompaniment of another sausage posing as meat! The horror! Did I mention that I was sick for two days afterward? I really was, and that was the beginning of my distaste for polenta for the subsequent decade. Things change, people change, and so do plates. 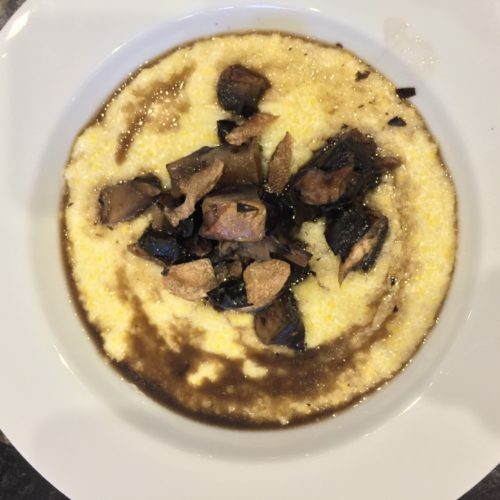 Another forced meal with polenta becomes a game changer, and ever since, I’ve been a fan of it fried, grilled, baked and even served as porridge with stew or a nice broth. The day I futzed around with this recipe it was really about necessity. 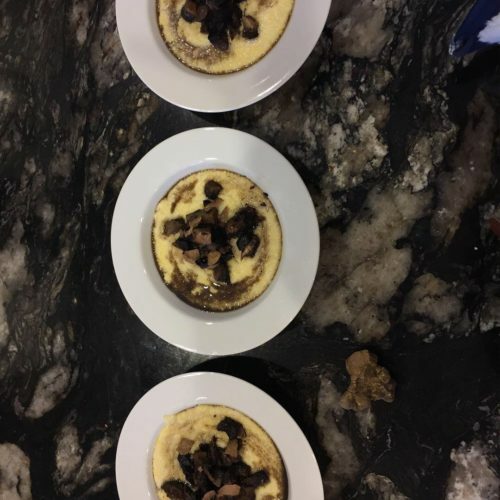 I wanted to enjoy this treasure trove of truffles and I didn’t want to stand over the stove for 45 minutes and make risotto, so I opted for polenta. The result was success, and Prima and Secondo seemed beyond pleased. They kept taking photos and asking about the market value of truffles and smacking their lips. It is always nice to be needed in the kitchen. It is even better to be appreciated for your inner genie. In a medium pan, over medium heat, add butter and olive oil, shallots and mushrooms. Sauté until slightly cooked. Add in wine and simmer. Cover pan to capture some of the mushroom and wine juices while the mushrooms continue to cook.